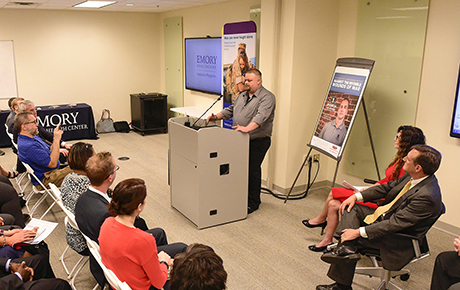 Matthew Barnes, a former marine and Emory Healthcare Veterans Program patient, shares his personal story of dealing with PTSD. Emory’s Veterans Program formally opened a new intensive outpatient treatment program for post-9/11 veterans at a ceremony on Wednesday, May 25. The program is a comprehensive, two-week treatment program that aims to reduce the symptoms of post-traumatic stress disorder (PTSD), while helping veterans re-engage in daily life and promoting physical and mental health and wellness. Program director Barbara O. Rothbaum, PhD, professor of psychiatry and behavioral sciences at Emory University School of Medicine, shared with those in attendance the critical need to provide care for those struggling from the invisible wounds of war. "This program is truly an innovation in veteran health care, and that’s worthy of celebrating", said Rothbaum. The highlight of the opening event was hearing the personal stories of two veteran-patients who suffered for years with PTSD and received help through the intensive outpatient program, which enrolled its first patients in February. "I remember being asked ‘what do you want to get out of this program?’ and I told her I wanted my life back. And that is essentially what they have done for me," shared Matthew Barnes, a former Marine. Another patient, former Army staff sergeant Carrie Smith, said the program was vital to her recovery and helped her deal with rage she had been harboring for years. Through the program patients have access to a wide range of services, from the Emory Sleep Center to help address sleep problems, to a physical rehabilitation suite for those who suffer from traumatic brain injury, to various recreational activities to build coping and relationship skills. Emory School of Medicine Dean Chris Larsen, MD, DPhil, spoke in support of the collaborative nature of the program. "To bring the full team of specialties together in support of our veterans and their families is just not something that has been possible," said Larsen. Emory’s Veterans Program is supported by the Wounded Warrior Project® (WWP) and is a member of WWP’s Warrior Care Network™, a national network of academic medical center partners committed to connecting veterans and their families with timely, effective mental health care. As part of the network, Emory is able to offer this care to qualified veterans at no cost. "WWP is so proud to be working with Emory, as well as our other Warrior Care Network™ partners, in this first of its kind network of care," said Jeremy Chwat, chief strategy officer of Wounded Warrior Project. For more information on the Emory Healthcare Veterans program, visit http://emoryhealthcare.org/veterans or call 1-888-514-5345.